"Herepeia" redirects here. It is not to be confused with Herepea. 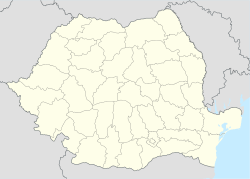 Vețel (Hungarian: Vecel; German: Witzel) is a commune in Hunedoara County, Romania. It is composed of ten villages: Boia Bârzii (Bojabirz), Bretelin (Brettyelin), Căoi (Káun), Herepeia (Filimon Sîrbu between 1948 and 1964; Herepe), Leșnic (Lesnyek), Mintia (Marosnémeti; Bayersdorf), Muncelu Mare (Nagymuncsel), Muncelu Mic (Kismuncsel), Runcu Mic (Erdőhátrunk) and Vețel. At the 2002 census, 91.6% of the population were Romanians, 4.7% Hungarians and 3.6% Roma. 87.8% were Romanian Orthodox, 4.4% Pentecostal, 3.1% Roman Catholic, 2.1% Baptist and 1.7% Reformed. Mintia village is the site of the Mintia-Deva Power Station. Wikimedia Commons has media related to Vețel, Hunedoara. ^ Romanian census data, 2002 Retrieved on April 8, 2016. This Hunedoara County location article is a stub. You can help Wikipedia by expanding it.